The late Nyurapayia Nampitjinpa – more frequently known as Mrs Bennett or Mrs B – is the latest Aboriginal artist to receive the accolade of a Big Picture Book costing over a hundred dollars ($110 from Macmillan, to be precise). I have tomes on Emily Kngwarreye, Queenie McKenzie, Kitty Kantilla and, just recently published, the Sally Gabori book based on Pat Corrigan's Collection. In the more distant past, Mrs B's co-biographer, Ken McGregegor turned his talents to Tommy Watson, Bill Whiskey, and the almost one hundred 'Artists of the Western Desert' amongst his prolific 21-book writing career to date. What's the motive for these publications? Crass promotion of the artist to boost his/her marketability? A more generous promotion of the industry as a whole through the work of a star? Perhaps the preponderance of art imagery draws in a mildly interested readership that can be educated about the life of an artist so far from its own experience and thus into a greater understanding of Indigenous culture? Or – going right out on a limb – could we hope to find a critical study of the art and the context of its making in line with Nicolas Rothwell's recent appeal for benchmarking across the Aboriginal art industry against which work could be objectively appraised? With 'The Art of Nyurapiya Nampitjinpa', I suspect we have a rather successful mix of the first three motives in play – almost certainly more successful than either the Watson or the Gabori books. For, with the co-writing assistance of gallerist Ralph Hobbs, McGregor has gone well beyond the first person narrative of engaging with this 'irrepressible' artist and taken us into important aspects of Aboriginal art's brief history, the key importance of the visual to a non-literate culture, controversial matters relating to Mrs B's choices in the way she preferred to work, pictorial evidence of the way Mrs B approached story-telling on canvas, and rather surprising linkages to the Western discovery of Primitivism in the early 20th Century, giving no less a figure than Kandinsky tenuous associations with Mrs Bennett. Christopher Allen will hate that! As he may also be enraged by his colleague at The Australian, Nicolas Rothwell's introduction to the book, linking the subject-matter of so much of Mrs B's painting – the lush, “splendid isolation” of the Punkilpirri Rock Holes in the remote Walter James Range of hills – with Monet's garden and Cezanne's Mont Sainte-Victoire as “a defining artistic landscape associated with a single master”. 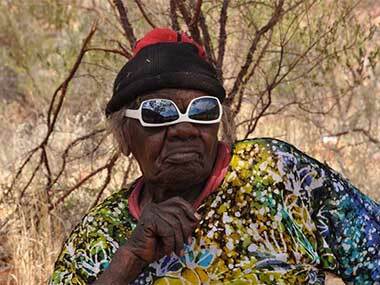 Now, the facts of the matter are that Nampitjinpa was a Pitjanjatjara woman born in the early 1930s who married the Pintupi man, John John (Mr) Bennett and thus became associated with Papunya Tula art royalty in the persons of Uta Uta Tjangala and Timmy Payungka. The Pitjanjatjara were generally discouraged by both their elders and the system from painting at this time, happily producing crafted sculptures in wood (punu) with traditional designs (walka) burnt into them by the likes of Mrs B. In Papunya Tula circles, it was assumed that only men painted. However, as a 2006 essay by former art co-ordinator, Marina Strocchi reveals, constant pressure by the women of Kintore where the Bennetts lived eventually lead to a 1994 workshop in a camp outside that community where five major group canvases were produced, including one (filmed by Strocchi) where Mrs Bennett grabbed the brush from her cousin Makinti's hands before the great lady could make her very first stroke, saying, “I'll show you how to make a circle....you're too old to paint”! Later, at a second workshop in Haasts Bluff, the pair were reconciled enough to tackle a 3 metre canvas together, though Strocchi reports Nampitjinpa completely repainting it on her own overnight, telling her the next morning, “Yuwa – finished properly now”. So, we've learnt a little of the woman's character – amplified by the tale of her jumping laughingly aboard a camel as a teenager making her First Contact with a white man - and something about her artistic/cultural standards. The painting group's valuation of their canvases was also interesting. At the end of the Kintore camp, the immediate urge was to put their work on the market and 'change' it for ready money! And why not, when anthropologist Peter Sutton is on hand to explain: “The transience of the medium was not felt to be inconsistent with the sacred quality often attributed to the object itself. In Aboriginal eyes, it was the design that mattered most, not the object it decorated”. Fortunately, in this case, the pioneering Doreen Mellor was at Tandanya Gallery in Adelaide at the time and gave the women a commercially (and artistically) successful show, with the NGV, Campbelltown Art Gallery and the US Kelton Foundation pouncing on these early women's works. The book then shows an amount of Mrs B's early work for Papunya Tula Artists (PTA), which reveals the emergence of her own personal style in about 1998. We then see its flowering through to 2012, most of its 'story' sung by the artist as she painted. It's this that allows Ralph Hobbs to speculate whether Kandinsky's efforts to “paint the sound of music” had not unrelated intent. What's sad about this flowering was that after 2004, most of Mrs B's work was unseen at the commercial galleries like Utopia in Sydney and Gabrielle Pizzi in Melbourne that had exclusive relations with PTA, it was unbought by our major public galleries, and unaccepted for resale by auction houses Sotheby's and Bonhams – despite a personal visit by the aggrieved artist to one of the company's head office! 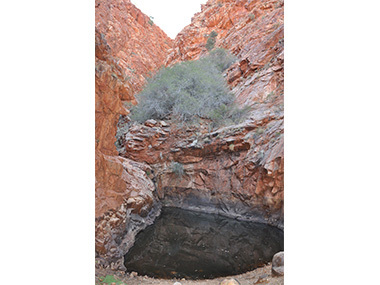 For, after Mr B died, Mrs B decided to take up residence just outside Alice Springs at Chris Simon's Yanda property where her every demand seems to have been met and where most of her significant canvases were painted. Now I have always argued that this sort of painting facility was almost precisely what a public body like Desart should have set up to protect the many desert artists who have to visit Alice for health, family or legal reasons from the temptation to paint quickly and cheaply for cash, cars or alcohol. In town, they're under pressure from family, backyard dealers or importunate debt collectors. Unfortunately, PTA has never gone beyond flats on an industrial estate. In comparison, Yanda offers bush, swags around a fire, health checks, food, and gates locked against carpet-baggers. Ultimately, it offered transport Mrs B back to her Country where she chose to die – movingly described in the book – when her health was failing. They also offered the 80 year old Nampitjinpa an outrageous 4.85 x 2.44 metre canvas to paint in 2012, providing the old lady with a challenge that, arguably, remained unresolved in a dauntingly large work of brown swirls on black that remains in the Yanda Collection. What the book makes apparent is the reluctant acceptance by PTA today that the Chris Simon nexus – which includes galleries like Hobbs's Art Equity, the writer McGregor, the translator Alison Anderson (who is also, of course both a Yanda artist and high profile NT politician) and her partner, the writer Nicolas Rothwell - has a right to exist in parallel with their own community art organisation. It's an acceptance that would sit in the craw of many southern gate-keepers of Aboriginal art. But it's a reality that the industry has to come to terms with. For the recent spate of Ronnie Tjampitjinpa shows – no doubt inspired by the Art Gallery of NSW giving this former Chair of PTA (indeed he was Chair when women like Mrs B were first encouraged to paint) a small solo exhibition, and including the 'official' Utopia and the less-than official Coo-ee, Kate Owen and Japingka Galleries – has made it clear that quality doesn't necessarily come only with a PTA Certificate of Authenticity. Sourcing Tjampitjinpa's art from any number of agencies, the unofficial trio mixed an excessive number of repetitive 'Bushfire Dreamings' and 'Tingari' squares tackled with plain brushstrokes rather than the more refined joined-up dotting of Ronnie's most serious work, alongside a 5 metre work like 'Fire, Tingari and Water Dreaming' at Coo-ee which is of institutional size and quality. Back to Mrs Bennett, though, I think the most significant insight I got from the new book was the notion: “Her paintings don't have an end; like the songs and the sandhills, they roll on in your imagination”. 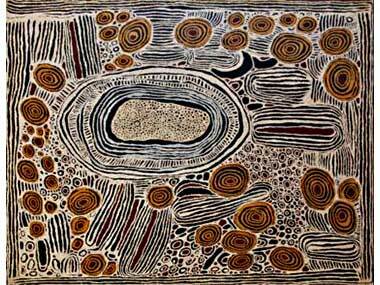 I'd also argue that the stories and the images also roll off many of her canvases – continuing like her Songlines from one language group to the next, from Melbourne to the ancient red-rock cliffs where The Kimberley runs into the Arafura Sea. It's an aspect of Indigenous art-making I've not considered before – a clear point of difference with the intent of most non-Indigenous canvases. I was also intrigued by the possibility that living a life without written words may have given Mrs B (and her peers) an “innate ability to transfer imagery on to canvas”. I have always assumed that Emily Kngwarreye and others of her quality did have a capacity to foresee exactly how they would cover a canvas with colour when they first squatted down beside it. And the rhythm of the songs that told the story would drive their brushes dynamically along. But does this lead unavoidably to the book's unfortunate conclusion that “the passing of the Dreaming” is inevitable as “much information has died with the last traditional people”? As 'The Art of Nyurapiya Nampitjinpa' had also begun with the 'Daisy Bates' suggestion that Mrs B had emerged from “a stone-age existence' – rather than one ecologically attuned to survival in this harshest of continents – I'd suggest that it be read for its artistic sensitivity and, given her self-restricted palette, for the rich and surprising variety of Nampitjinpa's art rather than for its sociological conclusions!